For the Respondents :- Mr. R.S. Riar, Sr. Advocate with Mr. D.P.S. Kahlon, Advocate. Criminal Procedure Code, 1973, Section 482 - Indian Penal Code, Sections 498a and 420 - Dowry Prohibition Act, Sections 3 and 4 - Accused in Police custody for an offence under Sections 498a and 420 and Dowry Prohibition Act - Accused not produced before Magistrate but let off by police - Accused fled away to Australia - S.S.P. directed to hold an inquiry against guilty police officers - Magistrate directed to take steps for extradition of the accused and also hear the parties in the matter of cancellation of passports. R.L. Anand, J. (Oral) - I have heard Shri R.S. Ahluwalia, Advocate on behalf of the petitioner and Shri R.S. Riar, Sr. Advocate, assisted by Shri D.P.S. Kahlon, on behalf of the respondents and with their assistance, have gone through the record of this case. 3. "To what an extent the police can connive with the accused is a glaring instance which has come to the notice of this Court for which an inquiry has become necessitated. 4. Smt. Sadhna Sharma, resident of House No. 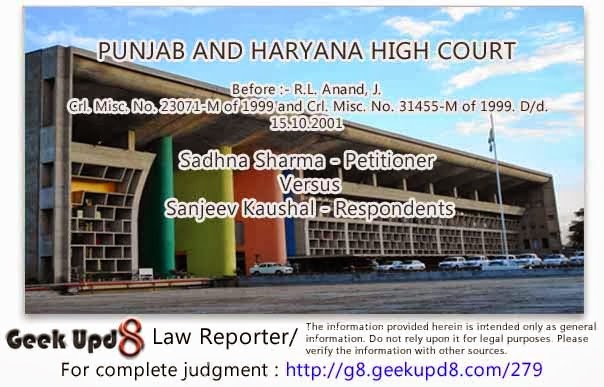 3329, Sector 19-D, Chandigarh, has filed the present petition under Section 482 Cr.P.C. praying that the investigating officer of the case FIR No. 46 dated 2.3.1996 under Sections 406 and 498-A IPC and subsequent offences under Sections 420 and 494 IPC be directed to initiate and take effective steps for impounding the passports of respondent Nos. 1 to 3 namely Sanjeev Kaushal, R.M. Kaushal and Smt. Sudharshan Kaushal, who have been declared as proclaimed offenders by the Court of Chief Judicial Magistrate, Chandigarh and to initiate steps for extradition of respondent Nos. 1 to 3, who are presently residing in Australia away from the arm and process of law. 5. On 2.3.1996 petitioner Smt. Sadhna Sharma lodged an FIR against respondent Nos. 1 to 3 in Police Station Sector 39, Chandigarh bearing No. 46 under the various Sections. The contents of the FIR have been produced in para No. 3 of the writ petition and I need not to incorporate the same in the present order because the controversy rests somewhere else. "Next day after this threat, my brother-in-law Mr. V.K. Sharma, in connivance with Sector 39 Police and after bribing the Sub-Inspector Balhar Singh and Rajinder Singh, lodged a false complaint/FIR No. 46/96 vide DDR No. 12 dated 2.3.1996 under Sections 406, 498-A IPC against all of my family members (father, mother and brother) without any evidence or documentary proof supporting their false allegations. Our luggage in the house was also searched by Sub-Inspector Balhar Singh, in the presence of the complainant Mr. V.K. Sharma. The police fully misused their brutal power and position to humiliate us before the complainant, without any evidence or documentary proof. Myself, my brother, Dr. Rajeev Kaushal and aged father Mr. R.M. Kaushal (72) were detained in the Sector 39 Police Station for two nights and we all were put under house-arrest for about a week. 7. The above contents would show that police went into action after registering the case. Prima facie offence was made out. It was incumbent on the part of the police to arrest the accused under Section 41 Cr.P.C. and for the reasons best known to them under what circumstances, the three accused escaped from the police custody is a matter of inquiry for which the orders are going to be passed in the present order. 8. In the additional affidavit dated 27.1.1997 filed by respondent No. 5 it is fully established that Sanjiv Kumar Kaushal accused made a complaint to the Home Secretary. The stand of the Union Territory Administration in the present affidavit is that since the investigating agency was working sincerely and was making efforts to do justice to the complainant therefore, Sanjiv Kaushal wrote a letter to the Home Secretary. It has also been clarified by Shri Yadav that complaint of Sanjiv Kaushal was dealt with by the Home Secretary and inquiry into the allegations was made which was considered by the DSP Crimes U.T. Chandigarh and nothing was found in the conduct of the investigation in the light of the stand taken by respondent No. 4, the affidavit of Balhar Singh becomes of little bit importance. In para No. 3 of the affidavit dated 6.2.1997 this officer has stated that he was not the investigating officer of the case in hand at any stage of the investigation. It was specifically stated in this affidavit that the deponent did not make any entry in the police diary nor he recorded any statement under Section 161 Cr.P.C. of any witness during the investigation. The Investigating Officers of this case were Rajinder Singh ASI and Mani Ram Kadian. The investigation was entrusted to Crimes Women Cell later on and the investigation was conducted by Shri Hardev Singh Inspector and Jagbir Singh Sub-Inspector. One thing has become very pertinent from the affidavit or Balhar Singh that he does not deny his presence in the police station on 2.3.1996. 9. It is the admitted case of the parties that the accused Nos. 1 to 3 at present are not residing in India and they have gone to Australia. Also it is the stand of respondent No. 4 that these three accused were declared proclaimed offenders. However, the challan against respondent Nos. 1 to 3 has already been put in Court in their absence. Nobody can escape from the clutches of the law which is the supreme as repeatedly held, and said by the Hon'ble Supreme Court. Also the police, whether it belongs to the State or Union Territory cannot be allowed to play havoc with the provisions of law. The police has to discharge its duties sincerely and cannot be allowed to connive either with the complainant or with the accused. This trend of connivance has been seen repeatedly by the law courts. On 2.3.1996 onwards respondent Nos. 1 to 3 were in the custody of police as per the admission of respondent No. 1. Under what circumstances they were let off and by whom, is a matter which requires to be adjudicated. This Court is not convinced with any amount of argument which is coming from the side of the respondents that on 2.3.1996 onwards respondent Nos. 1 to 3 were never in the custody of the police authorities of Police Station Sector 39, Chandigarh. v) Mr. Reddy will also enquire into the allegations under what circumstances these three persons left the country without prior permission of the police or prior permission of the court concerned. 11. In the inquiry, the inquiry officer Mr. Reddy shall associate the complainant who will be at liberty to lead such evidence in order to support her allegations of the present petition. 12. The inquiry officer shall submit the report to this court within six months from the receipt of the copy of this order. 13. The order to give effective relief to the petitioner directions are given to the trial Court to take all appropriate and legal steps in order to secure the custody of respondent Nos. 1 to 3 and the trial Court should go to the extent in making a liaison with the Government of India for the extradition of respondent Nos. 1 to 3. 14. Directions are also given to the learned Chief Judicial Magistrate to make a move to the Passport Authorities for the impounding/cancellation of the passports of respondent Nos. 2 and 3. These directions have become necessary so that all the respondent Nos. 1 to 3 may face the prosecution against then. Copies of this order be sent to Shri C.S.P. Reddy, SSP, Chandigarh and Sanjiv Kumar Judicial Magistrate 1st Class, Chandigarh. 15. Before I part with this order it is left open for the trial Court to withdraw the order declaring respondent Nos. 1 to 3 as proclaimed offenders. This petition stands disposed of." 16. Thereafter, the learned Magistrate vide his order dated 15th March, 1997, Annexure P-2, recalled the order vide which was the accused were declared as proclaimed offenders by making observations in para No. 2 of the order that as the High Court had observed, therefore, he recalled the order vide which the accused were declared as proclaimed offenders. In the same order dated 15th March, 1997, the learned Magistrate attached the property of the accused. The petitioners have prayed for quashing the order dated 15.3.1997 (Annexure P-1), whereby the learned Judicial Magistrate 1st Class, Chandigarh has ordered for issuance of warrants of attachment of their properties in case First Information Report No. 46 dated 2.3.1996, Police Station Sector 39, Chandigarh. "It is left open for the trial court to withdraw the order declaring respondent Nos. 1 to 3 as proclaimed offenders. This petition stands disposed of." In pursuance of the direction aforesaid, the learned Judicial Magistrate 1st Class, Chandigarh in para No. 2 of his order dated 15.3.1997 observed that ".... the order declaring the accused as proclaimed offenders is recalled..." Further, the learned Judicial Magistrate in para No. 5 of his order observed that..." Warrants of attachment of the properties of the accused mentioned in the application be issued immediately..."
From the above quoted observations made by the learned Magistrate in the impugned order dated 15.3.1997, it is crystal clear that there are ambiguities in the same. Once the order declaring the accused as proclaimed offender is recalled, then automatically whatever consequences follow by withdrawing the order, cannot be taken into consideration. For the reasons stated above, I quash the impugned order dated 15.3.1997 (Annexure P-1) to this limited extent that the proceedings qua attachment of properties of the petitioners are held illegal. However, the learned trial Magistrate is directed to once again pass a fresh order in the light of the observations made by Hon'ble Mr. Justice R.L. Anand vide his order dated 25.2.1997." 18. Now a clarification is being sought by the complainant that the order passed by the learned Magistrate vide which he recalled the order of proclamation is illegal as the same is not in consonance with my order dated 25th February, 1997. 19. After hearing the learned counsel for the parties, I am of the opinion that the learned Magistrate did not appreciate the spirit of the order dated 25th February, 1997. While passing that order, I kept the matter open and it was observed by me that it will always be open to the trial Court to withdraw the order declaring the respondents as proclaimed offenders. Meaning thereby that the learned Magistrate was to satisfy himself whether it was a case of recalling of the order or not. Admittedly, the accused have not been arrested so far. They are residing abroad. The FIR was registered as far back as in the year 1996 and till today the respondents are not responding to the law. In these circumstances, the order of the learned Magistrate for recalling of the order vide which the accused were declared as proclaimed offenders was illegal. In this view of the matter, the order dated 15th March, 1997 is hereby set aside to the limited extent. Directions are given to the learned trial Court to pass a fresh order as to whether it would like to recall the order vide which the accused were declared as proclaimed offenders. In view of the facts and circumstances explained above and before passing this order on merits, the trial Court shall afford opportunity of hearing to both the parties. The learned Magistrate shall pass this order within fifteen days from the date of receipt of a copy of this order. Till the final order is passed by the learned Magistrate, the respondents are directed not to withdraw cash amount from the Bank. 20. The parties are directed to appear before the learned Magistrate on 7th November, 2001.